One iPhone model. Two sizes. Aside from a suite of feature and software improvements, the iPhone 6 is also getting upgraded in screen size -- the smaller version at 4.7 inches, with the Plus option at 5.5 inches. The more petite iteration is what I'll focus on here, though you'll be able to take a look at the larger size here. Aside from the difference in diagonal screen size, there's very little to tell these two versions apart until you start looking deeper; the Plus comes with a bigger battery, better display, one-handed mode and an extra stabilization feature on the camera, but everything else is essentially identical. Take a look at the photos and video below, along with a few thoughts from my first encounter with the new iPhone. Naturally, there's going to be some hesitation by those who've been used to the 3.5-inch or 4-inch size of all previous generations of the iPhone, but the 4.7-inch model is still reasonable enough that most users should easily get used to the new size. At 6.9mm, it's thinner than the 5s (7.6mm), and its curved sides bring a sleek look that should still be plenty comfortable for most traditional iPhone fans. 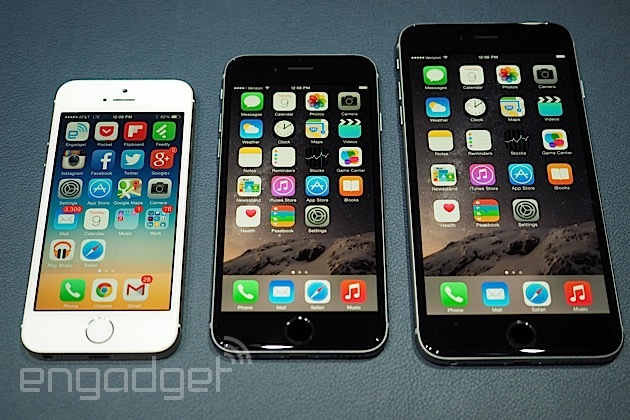 I had no problem gripping the iPhone 6, and it felt right at home in my palms. However, it's not going to be the smallest phone of its size: Last year's 4.7-inch Moto X, for instance, is 1.7mm narrower and nearly 9mm shorter than the iPhone 6. That means its curved edges and thin body will be the saving grace for most; the aforementioned X is 10.4mm thick, over 3.5mm beefier than Apple's version. The iPhone 6 has a 1,334 x 750 resolution, which translates into a pixel density of 326ppi -- if you're keeping count, that's exactly the same as the iPhone 5s, just adjusted for a larger size. So if you were perfectly happy with the display quality on the 5s, I'd wager that you'll have a very similar experience on the 6. That said, the 6 Plus, with its 5.5-inch panel, comes with a 1,920 x 1,080 resolution for 401ppi density, so it's certainly better from a technical standpoint. I'm looking forward to putting both phones through their paces, but in a brief hands-on, the difference seemed marginal enough that it likely won't be a deciding factor for anyone trying to choose between the two sizes. Most of the controls are in the same location as previous iPhones, but the power button has moved from the top side to the right. Apple felt this was necessary given the bigger size. This makes the most sense on the Plus, since it would be quite difficult to reach if it were still in its old location; on the smaller 6, I don't think it was essential -- I've used plenty of similar-sized phones with the button on the top -- but this will likely be much more comfortable for most people used to the 4-inch iPhones. A volume rocker and mute switch are on the left side, while the 3.5mm headphone jack, Lightning connector port and mic/speaker setup are on the bottom. The top side? Now bare and smooth. The aluminum back's layout is very similar to earlier phones -- the camera and True Tone flash are on the top-left corner, with only a stainless steel logo and FCC information farther down -- but the camera module sticks out from the chassis (necessitated by the iPhone's thinness) and the entire back is the same color, with the exception of a couple lines that dissect the top and bottom sections. 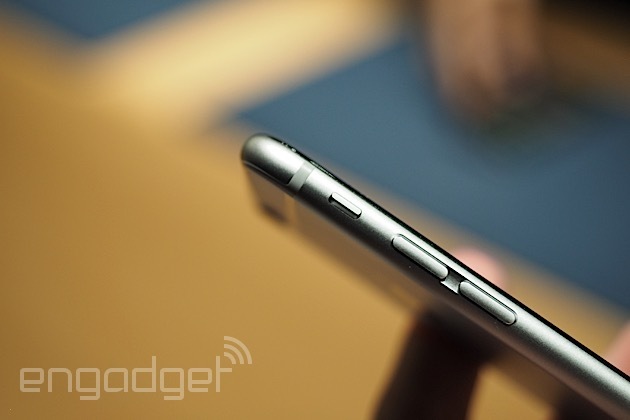 In direct contrast to the sharp design of the 5 and 5s, Apple has chosen to go back to round. The chamfered edges of the 5 and 5s are gone, replaced by a pane of 2.5D glass (which Apple refers to as "ion-strengthened") that slightly bends down to meet with the bubble-curved edges. The choice is to ensure folks can use gestures and swipe to their heart's content -- say, with the keyboard -- and won't be distracted or interrupted by the phone's design. In other words, this is supposed to be more of a pebble-like experience on top. Of course, one of the biggest and most anticipated features in the iPhone 6 series is NFC (near-field communication). In a nutshell, this makes it possible for Apple Pay, a wireless-payment method that's being embraced by hundreds of thousands of merchants and a large handful of popular banks. As long as your payment terminal supports NFC, you should be able to use any American Express, Visa or MasterCard account to make payments. And since Apple knows there will be privacy concerns, it made special care to mention that the company doesn't even get access to the information; only your bank and credit card provider will have that information. It comes with an 8MP camera, but if you haven't figured this out by now, Apple doesn't really care so much about specific resolution as it does all of the other stuff behind the scenes. The main improvement seems to be the Focus Pixel feature, which is Apple's take on phase-detection autofocus. 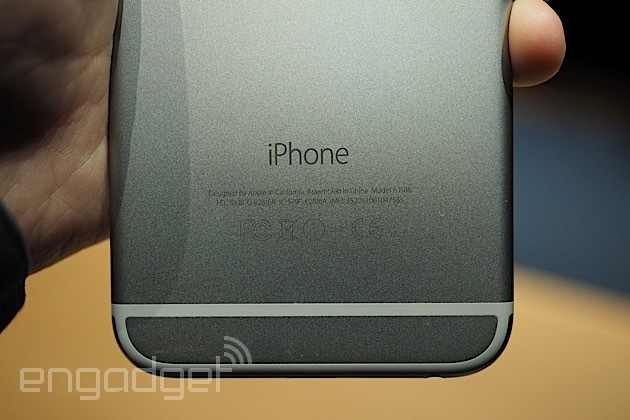 We've seen this feature on competing flagship devices before, but it's nice to see it added onto the iPhones. In short, it's supposed to allow the camera to lock focus and snap shots faster than before. It seems as though most of the other improvements are only in the higher frame rates for video (up to 60fps for 1080p video and 240fps for slow-motion, as well as continuous autofocus) and the optical image stabilization found only on the iPhone 6 Plus. While Apple claimed in the keynote that the new camera had bigger pixels (1.5-micron) and a larger aperture lens (f/2.2), it appears to be exactly the same on the 6 as it was on the 5s. Apple's remaining tight-lipped on its processor specs, as usual, but the brand-new A8 chip is smaller and has more transistors than the A7 used on the iPhone 5s. It's also got the same 64-bit support, as expected, as well as a new motion coprocessor known as the M8 (a bump from M7 on the 5s), which adds barometer support in addition to gyroscope and accelerometer sensors. The iPhone 6 will start at $199 on-contract for the 16GB model, while the 64GB and 128GB versions will be available for $299 and $399, respectively. Pre-orders begin on this Friday, and the first units will arrive in stores on the 19th. Photos and video by Zach Honig.